Who is in Heaven? Who is in Hell? 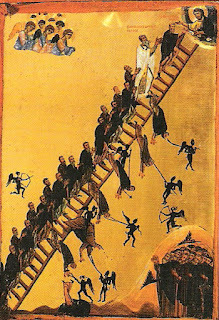 The Ascent to Heaven - not always easy! Thinking further on the Last Judgement, I remember a moment of doubt prior to my baptism. The Orthodox Church, like all human institutions, is not free of zealots and fundamentalists and I read in one booklet a very worrying statement. In essence it consigned to Hell all who did not accept the Orthodox Church in its totality. The Roman Catholic Church (and, by implication, the Anglicans and all Protestants) are heretical and thus cannot expect to be saved. Now, although on strictly self-preservation grounds, this might be seen as an overriding reason for joining the Orthodox Church, it had the opposite effect on me. The great Marx (Groucho not Karl) once said that he wouldn’t want to join any club that was prepared to accept him as a member and I, in a sort of mirror image, would find it very hard to become a member of a Church that condemned me to Hell if I wasn’t a member! I could not accept that the sincere Christian beliefs I had held for fifty odd years would deprive me automatically of salvation, not to mention all the truly good Christians I have met in all denominations. Can I really believe that my mum is in hell? I can accept in theory the concept that Catholics, Anglicans, Baptists, Methodists or Quakers are 'heretical' in the sense that they have diverged from the original faith and practices of the Christian Church (although aspects of this statement may well be arguable). However, to say that they are totally outside God’s love and mercy seems to me to be unacceptable – almost a heresy in itself when set alongside the teaching of Christ. ‘In my Father’s house are many mansions’ and there must surely be a place in one of them for all who truly and lovingly follow Him. The very words of the Saviour when speaking of the final judgement are unequivocal; the sheep and goats are not divided by denomination or creed but by their willingness to follow the Lord in act as well as word: “Then shall the righteous answer him, saying, ‘Lord, when saw we thee hungry, and fed thee? Or thirsty, and gave thee drink? When saw we thee a stranger, and took thee in? or naked, and clothed thee? Or when saw we thee sick, or in prison, and came unto thee?’ And the King shall answer and say unto them, ‘Verily I say unto you, Inasmuch as ye have done it unto one of the least of these my brethren, ye have done it unto me. '” Can anybody be sure that the Protestant Schweitzer or the Roman Catholic Mother Teresa were not following the word of God? So, was I damned if I didn’t join the Orthodox Church? It did not take me too long to realize that this was an extreme view and that mainstream Orthodoxy, throughout the centuries, has interpreted the relationship between the Church and salvation in a very different way. Yes, the Church is the source of salvation for the world but, as fallible humans, who are we to know exactly what constitutes Christ’s true Church? Metropolitan Kallistos again came to my rescue: the doctrine that “outside the Church there is no salvation, because salvation is the Church” does not mean “that anyone who is not visibly within the Church is necessarily damned … . Still less does it follow that everyone who is visibly within the Church is necessarily saved. As Augustine wisely remarked, ‘How many sheep there are without, how many wolves within!’” So, I was returned to the fundamental fact that the Spirit of God can be found in the most unlikely places and times. As Alexander Schmemann puts it: “In the great religions which have given shape to human aspirations, God plays on an orchestra which is far out of tune, yet there has often been a marvellous, rich music made.” This particular battered old fiddle was relieved to realize that, even if I hadn’t had the great fortune to discover the wonder, beauty and truth of the Orthodox Church, I might still have had some hope of salvation. I am reminded of a delightful story that gently pokes fun at the exclusivity of the Christian denominations. St. Peter was giving a newcomer an orientation tour of Heaven. They came to a high wall over which was wafting the most beautiful singing. “Who is making that wonderful music?” asked the newcomer. “Shush” said St. Peter, “It’s the Catholics, but keep your voice down - they think they’re the only ones here.” For 'Catholics' read almost any church or denomination you can think of! After Christopher Hitchens got his cancerous death sentence, Jeremy Paxman asked him: Isn't it time to take Pascal's wager? (Paxo probably added: Come on, I need an answer.) Sed Hitch: If God is conceived as valuing honour and honesty, won't he welcome an honest sceptic sooner than a cynical gambler who "believes" simply because the odds are better? The conversion of the Emperor Constantine seemed like a good idea at the time. The Christians had converted the Roman Empire, i.e. the "known world", to Christianity; so they had done exactly what Jesus had told them to do. In the event, it turned out to be a disaster from which the Church has never recovered. The Church became a branch of state, of government, of the civil service; with all that that implied for excess fat, excess baggage, bandwagon-jumping, gravy-training, careerism; interspersed with periodic clear-outs, schisms, revolutions, back-to-basics etc. In other words, the Church was infected by all the evils of human institutions. Hi Ralph. Glad you're taking an interest in my ramblings. 1)I was never a great fan of Christopher Hitchens but I must admit I think he had a point about Christianity as an insurance policy. 2) I think you're commenting on a blog I haven't posted yet. See 'The Church and Politics' in a few weeks' time. There is a lot of truth in what you say but I still think it's fair to draw a distinction between the 'spiritual' Church and the Church as an institution. The former comprises the teachings of Christ as handed down through the centuries and held (reasonably) intact by the Church; the latter is a human institution subject to all the sins you mention. Reread the comment by St. Augustine. Hi Chris! Only too happy to comment - and to ramble. I think the point about Constantine's conversion being a disaster from which the Church has never recovered was 'borrowed' from Arthur Wallis in "The Radical Christian". Hello Chris! I'm sure your distinction between the spiritual church and the institutional church is scholarly, but the public might need more convincing. Organised religion has had a bad press lately, not least because of the disagreements about who might end up in heaven; whereas subjective generalized spirituality has fared rather better. Oh God, are that lot up there as well?